Biking, walking and jogging enthusiasts enjoyed a big victory yesterday when the city announced a new trail, the 312 RiverRun, and broke ground on what will be the breathtaking Riverview Bridge (pictured). The 3-1-2 RiverRun trail will connect three city parks via one bicycle and pedestrian path for two miles. It'll be great for city residents to have safe and easy access to the green spaces of Clark, California, and Horner Parks, all lining the river. The new trail includes two projects, the Riverview Bridge and the Irving Park Road Bridge, and will provide a continuous path from Belmont to Montrose. The Irving Park Bridge repairs and construction of an underbridge path that connects California and Horner Parks will start in 2018. 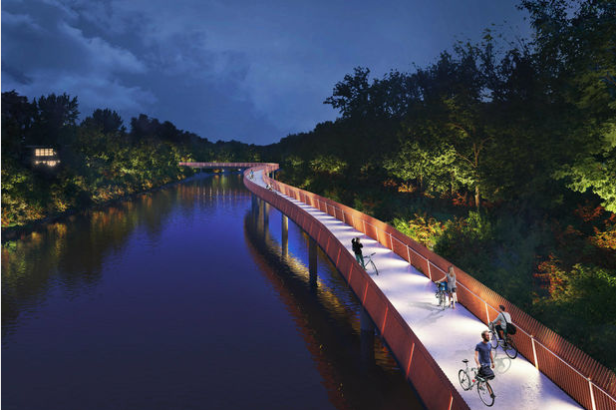 The Riverview Bridge will soar 18 feet above the water and cross over the North Branch from the eastern edge of Clark Park to the western side of California Park. Scheduled to be completed in 2018, it'll be the longest pedestrian river bridge in the city and span a length of 1,000 feet. Elected officials recognize the value a seamless river path will bring. I am excited about the Riverview Bridge as it relates to two important bicycle connections: the future Irving Park underbridge and Manor Greenway, said 33rd Ward Alderman Deb Mell. The 312 RiverRun is a huge step towards our goal of a continuous trail that connects the city's north and south sides. We're thrilled to see the city take major steps towards a continous Chicago River Trail. These projects show it's possible to develop creative solutions when there's a shortage of available land. It'll be important to keep this in mind as the Chicago River Trail coalition works to add trail sements along the North and South Branches in the coming year. Momentum continues to rapidly build for a continuous Chicago River Trail. Earlier this year, Chicago City Council passed a redevelopment plan for Goose Island that advanced key bicycle and pedestrian projects. In August, the North Branch extension added two miles to one of the busiest trails on the northwest side. Recently, the River Edge Ideas Lab opened, featuring design concepts for extending the Chicago Riverwalk to Ping Tom Park in Chinatown. It's exciting to see progress on so many trail segments along the river. Have you joined the Chicago River Trail campaign? Sign up here.